You might have heard about the Carrier IQ app that “logs text messages, dialed calls, URL searches and more — all without the user’s knowledge” (Gilbert). If you haven’t, you can read about the online exposure and the response in this article. In strikingly similar news, Ally Bank is tracking users’ locations as well, because “[i]n these economic times, financial institutions like banks are looking for extra revenue sources” (Yoo, in Kavoussi of HuffingtonPost). Both phone carriers and the bank, though, failed to tell clients that they were being tracked. I know, I know. We’re all appalled. But are we surprised? There’s been a lot of political talk about the rights of corporations lately, and given what we know about Google and Facebook privacy, we might not be as shocked as we’d wish. “Outrageous!” I find myself thinking. “They’ve got no business tracking my whereabouts, purchases, texts, and searches.” And yet, it is just that– business. So what does this mean for the — dare I use scare quotes– “individual”? It means that we’ve become commodities; it means our secrets have become commodities. What we do with our time, in our homes, on our phones and computers, has become valuable to others, to strangers, to anonymous and autonomous corporations. How did this happen? Whose fault is this? What can we do? And importantly, on what do we base our assumption that we can, and indeed should, hide what we’ve been doing from these faceless, nameless, number-crunchers? What is the value of a secret? I recently turned in a paper about what I call the “Economy of Secrets” in two of the Canterbury Tales. 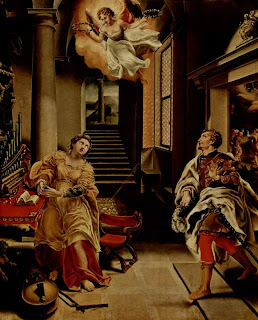 I spent most of my time on what editors usually call “The Second Nun’s Tale,” which is based on the legend of Saint Cecilia, who seems to come from the 5th or 6th century. Like so many saints’ legends, hers is the story of her virgin martyrdom at the hands of persecuting Romans. On her wedding night, she tells her husband that she has a secret. He’s fine with that, and promises his discretion in exchange for her revelation. “I have an angel who protects me from anyone who would love me uncleanly (physically),” she responds. Rightfully skeptical, her husband Valerian tells her that he can’t see an angel, but if she will show him the creature, he will do as she wishes. 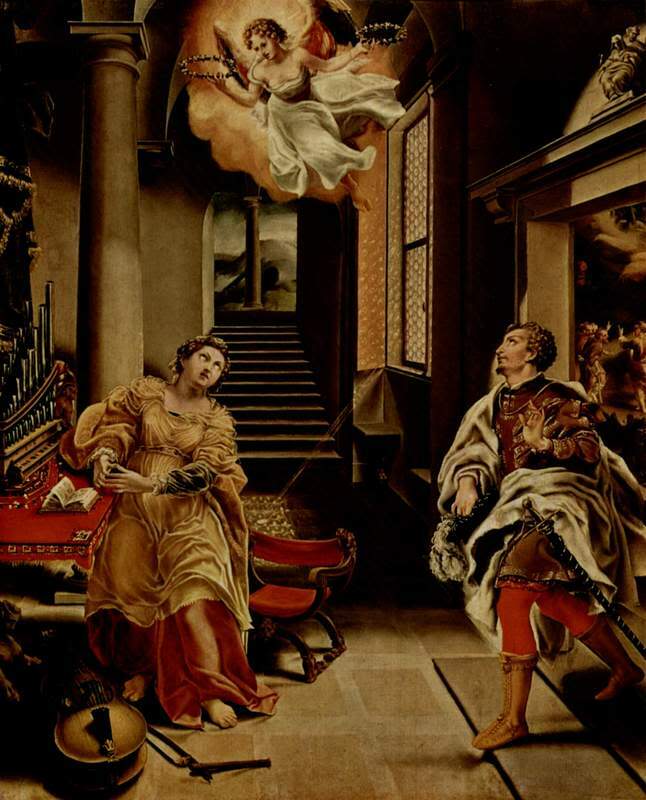 Cecilia replies that he must be confessed and baptised in order to see the angel, and his conversion sparks a series of events that allows her to convert the hearts of countless others until her martyrdom. Although I began my research looking for ways in which the body was valued, and how that value might have related to the narrative strategy of the original legend and Chaucer, I ended up discovering something else: the secret has extraordinary purchasing power. In a way, the whole story is set in motion when she trades her secret for his confidence. After converting her husband and his brother (who are martyred for their belief in the middle of the story), she is also brought into the authorities for practicing Christianity. Although her faith has been revealed, the public interrogation provides her with a last (and her largest) audience to convert. Ultimately she gives her life– her bodily life, anyway– to turn pagans into Christians, and Pope Urban takes her body away in the night to bury it in secret. On the hallowed ground of her hidden body he builds a church, which according to the legend still inspires worshipers. Her body becomes the secret– the object valued as something once hidden, now revealed. It seems, then, that we’ve had a preoccupation with the powers of secrets for quite some time. Although the situations are quite different, both my newsfeed and this saint’s life demonstrate the inherent value of secrets to outsiders and the power of disclosure. And yet, when Cecilia’s story narrates a series of exchanging secrets, our current story tells a far different tale. What do we receive in exchange for our browser history, or GPS use, or MMS? Is ours the narrative of a zero-sum game rather than trade? Whether for profit, salvation, or persecution, we endow great value in secrets. But given the current stakes, will we ever see a return on this investment?